In a large bowl combine all the ingredients except oil. Mix well and chill for 15 minutes in the fridge. 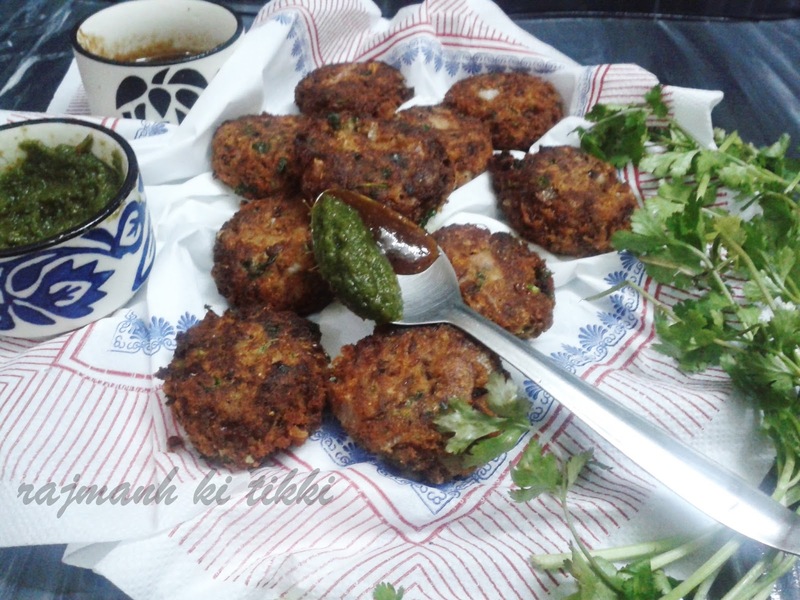 Divide into equal portions and make tikkies of desired shape and size. Deep fry in hot oil or shallow fry in a small amount of oil in a nonstick pan using little oil, over medium heat till cooked from all sides. Serve hot with ketchup or a dip of your choice or you can use this as burger in a bun. You can also use leftover rajmanh after straining the gravy. Boiled potates can also be added in the mixture of tikkis. If you opt to shallow fry then you can reduce the quantity of bread crumbs. 1/2 cup finely chopped vegetables like carrot,peas,capsicum,french beans,cauliflower,onion. Combine all the ingredients together, except the fruit salt in a bowl and mix well adding water approx. 1 cup to make a thick batter and keep it aside for at least 10 minutes. Add the fruit salt just before steaming,and add 2 tsp of water over it,when the bubbles appear, mix gently. Pour the batter immediately into greased muffin molds or idli mold and spread the batter evenly. Steam for 10-10 minutes and check with knife if the knife comes out clean then it's o.k. otherwise steam for 2 -3 minutes more or till the dhoklas are cooked. De-mold these and keep them aside. When the seeds crackle add green chillies and asafoetida, mix well and sauté on a medium flame for a second, while stirring continuously. Remove from the flame, add 1-2 tbsp water and pour the tempering over the dhoklas. Cool slightly and serve immediately garnished with coriander. 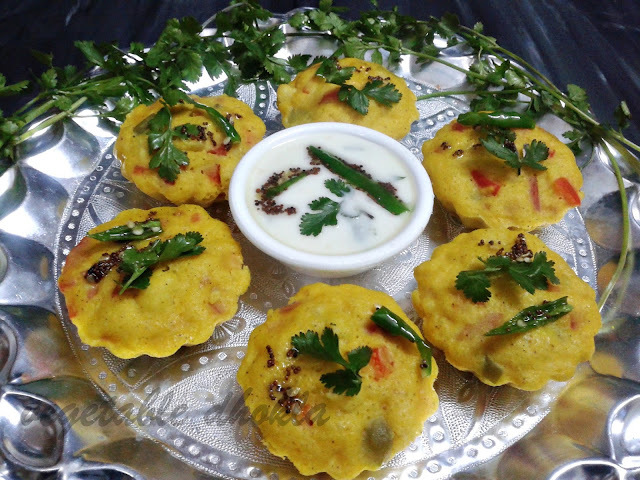 You can serve these dhoklas with ketchup, tamarind chuttney,green chuttney or with south indian style curd. Put the yogurt in a strainer and keep it in the fridge for 4 hours.After 4 hours this will become thick and creamy. Chop the strawberries into chunks (keep some aside for garnishing). Take 1/4 cup water in a pan and add strawberries, sugar and cardamom powder to it. Boil till the strawberries become soft and the sauce becomes thick. Now either press the strawberries with a fork, if you like chunks of strawberry in the srikhand or puree it in a mixer or with the help of a blender. Let the mixture get cool. Mix the creamy yogurt with 3/4 th of the strawberry sauce and give it a gentle stir. Garnish the strawberry shrikhand with rest of the strawberry sauce and strawberry chunks. 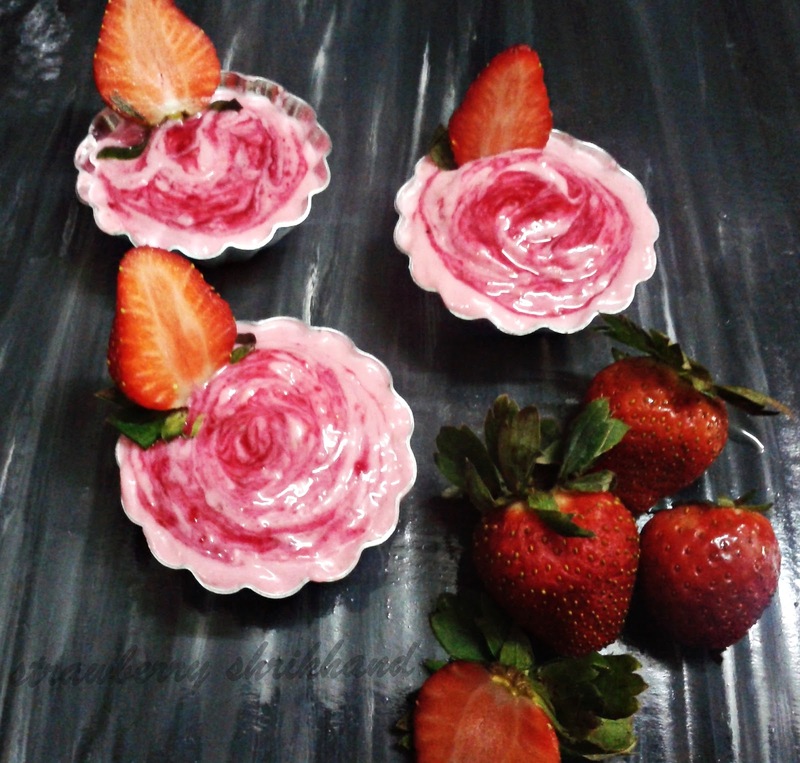 To make a pattern pour 1 tsp of strawberry sauce on the top of the shrikhand and swirl it through a fork or toothpick. Boil,cool,peel and mash the potatoes well. Heat a 1tbsp of oil and add ginger garlic paste. Add mashed potatoes,1/2 tsp.sabzi masala,degi mirch powder,chopped chilies ,coriander leaves and salt and mix well. Let the mixture cool. Now take the gram-flour, add turmeric powder,1/4 tsp sabzi masala,soda-bicarbonate and salt to it. You can also add a pinch of red chilly powder to it. Add water little by little and make a slightly thick batter of coating consistency .There shouldn't be any lumps in it. Heat oil in a wok (kadahi) and dip each potato ball in the besan batter. Coat the ball evenly with the gram flour batter. Pick up the batter coated ball with the help of a spoon or fork and carefully drop or place it in hot oil. Fry them on medium flame till golden brown in color from all sides.Drain them out on an absorbant paper and keep aside. Grind all the green chutney ingredients with little water till smooth. avoid making a watery chutney. Take all the ingredients of tamarind chuttney in a pan, mix well and cook for 10-15 mins or till the mixture thickens. let it cool. Heat a tsp of oil in a pan and crackle green chilies. Sprinkle a pinch of salt over them. For dry red chuttney take 1/2 tsp degi mirch powder,1/2 tsp. garlic powder and salt or black salt to taste and mix well. Slice the pav without breaking it into two parts and keep aside. 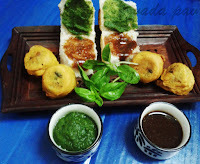 Spread green chutney on one side and sweet chutney on the other side of the sliced pav. 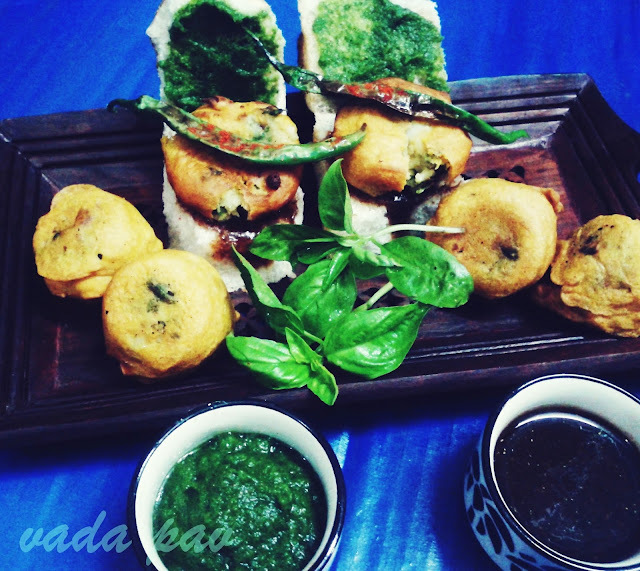 Place the hot batata vada on the pav. Keep a crackled green chili on the vada. Sprinkle the dry red chutney and serve vada pav immediately or else the pav becomes soggy. Hereby I am providing you the link of a list which can help you order your grossery,vegetables and fruits easily. Sometimes we go to the market and bring all the desired goods accept one or two for that we go to the market again. So here is a list of the items we need in any Indian kitchen and are available in all the super markets or in big grossery shops. So always keep a printout of this list with you and make a list of the items you want to bring from market or you want to order. I am using this list for last 20 years and believe me I make my list from this list and I need not bother for the whole month for the grossery . Just before making the list check what all you have in the stock and make a list according to your family requirement once in a month for grossery, once in a week for fruits and vegetables and daily for dairy products. You can add more items if I missed any as per your family requirements.